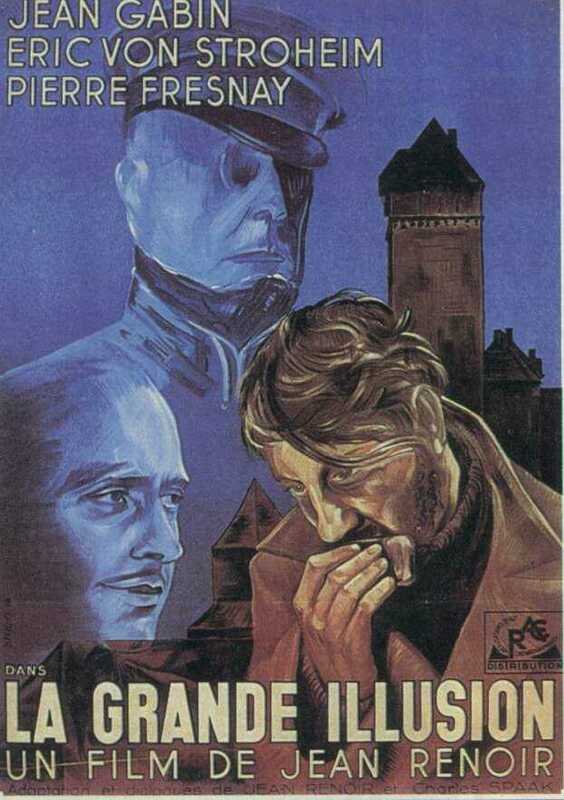 Jean Renoir’s celebrated film Grand Illusion, a humanistic ode to common humanity, in this case the common humanity among classes and nationalities in a Europe coming apart at the seams, a Europe later to be horrifically transformed by ideological extremes, could be viewed through the lens of contemporary America, increasingly economically stratified and divided into castes, culturally ruptured and ablaze with fundamentalist ideology. So viewed, one would have to conclude, sadly, Grand Illusion is a grand illusion. In this instance, I am inclined to tilt decidedly away from Renoir and emphatically toward Costanza. George Costanza once famously declared, “I was raised to give up.” I’m beginning to think surrender is the better part of wisdom in the grand American experiment. Or put another way, I no longer wish to have anything to do with those people, by which I mean the new feudalists and neo aristocrats of the right, the anti-intellectual and anti-rational philistines imbued with Ayn Rand juvenilia, whose projects are a bit too redolent, if not downright stinking, of the anti-democratic and the authoritarian. As a long embedded denizen of Hollywood let me go on the record and declare that failed actresses and failed screenwriters, particularly embittered émigrés like Ayn Rand should never, ever be accepted credulously as economic or philosophical gurus, even though in fairness tutoring in the vicissitudes of strip clubs is well within their wheelhouse. Yes, the notion of splitting America into two separate nations is outrageous, it’s preposterous, and a thing such as that will never happen. Nevertheless, which strikes you as the more daunting task: reconciling diametrically opposed views on virtually everything in a single polity; day by day futilely attempting to make laws and to solve problems in the current dysfunctional, if not dystopian fashion; or figuring out how to divide the nation into two different federal systems, say with a common defense department and perhaps a North American United Nations to settle disputes? Of course, UN troops on the border between Arizona and California wouldn’t be far away and the Idaho-Washington border is destined to be awash in the powder blue helmets of peacekeepers very soon. Should Florida go blue, it well may want to consider something along the lines of the Great Wall of China to separate it from Georgia and Alabama, though the panhandle would become the first Chechnya under this new arrangement, agitating to break away and join its soul mates with eleven fingers and toes across the border. As for names, the sentimental favorite for the red states has to be Potterville, though Randistan is likelier in the end. For the blue states my sentimental choice without question is Coolsville, with Rickie Lee Jones’ song of the same name serving as the national anthem. But, The Sane and Pragmatic States of America has a more august ring and probably would get the nod. The joint Defense Department isn’t going to be the colossus you might fear if you live in the blue states, nor will the fight over its size and funding be the brouhaha you imagine either. Assuming the nascent nation-states each contributes half the funding, the red states simply will not be able to afford a hefty contribution, since most of them are currently welfare states, meaning they get back in federal expenditures a great deal more than they contribute to federal revenue. The donor states, which are mostly blue, do the subsidizing. California for instance gets only eighty cents on every dollar it sends, while Mississippi and its ilk get $1.20 or more. But seriously, ponder for a moment the eventual comportment of these two respective nations. Randistan will free itself of the scourge of abortion and the accompanying scourge of prolific S-E-X they believe it encourages, while women in Coolsville will retain their reproductive rights, though I predict many discreet day trips across the border by more affluent and fecund Randistans. Randistan finally can slay for good its two-headed bête noir of Medicare and Social Security, and allow its elderly, with glorious freedom, in the words Mrs. Welland used in the Age of Innocence to describe the possibility for Countess Olenska cut loose by the Welland family, “to find” their “own level”. Environmentalism and all that is now green in utopian Randistan will find itself heaved by happy Randistans into history’s infamous dustbin, smog and particulates allowed to roam like the buffalo of yore, the color of the sky affirming the Randistan adage that brown is now the new blue, while those poor, enslaved citizens of Coolsville are forced to break the insidious link of dependency between breathing and coughing. In Randistan, ammonium nitrate will enjoy the freedom to shelter unbothered by the nanny state in its fertilizer plant of choice, free to ignite into as large a fireball as individual ambition and combustibility allow. No longer under the tyrannical thumb of OSHA, heads can literally roll in the happy libertarian workplace, where hands and feet aren’t a right: they’re a privilege. Funded by the economic engines of New England and the West Coast and the upper Midwest, and the creative classes and educational bastions residing there, a formerly seditious affection for science and empiricism practiced openly now, Coolsville will create the efficient, healthier universal health care system other modern industrialized nations long ago did, build a contemporary infrastructure for its technology, for its transportation and its education. Randistan, on the other hand will live the market dream of every man, woman and child for him or herself when it comes to doctoring, health care and basic education, all on an affordability, or shall we say, luxury basis; broadband, mail delivery and other trinkets of modernity available in neighborhoods where the Market God deems them viable. As Gershwin might say, S’ Wonderful. The windfall to California and New York alone of selling violent Blockbusters and reality television to addicted Randistans will put a car in every Coolsville garage and a chicken in every Coolsville pot, and a pot dispensary in every Coolsville neighborhood. Who does the work in Randistan is problematic, though. Minimum wage is verboten, benefits a communistic anachronism along with unemployment benefits and collective bargaining, and probably sick days too, though like Solzhenitsyn’s vision of the Czar, your employer-dictator perhaps will be benevolent if you’re very lucky. There will be no nefarious income taxes in Randistan, though there will need to be sizable sales taxes and usage fees if there is to be federal revenue at all, which means quite the disproportionate burden on members of the working class with the misfortune to remain there. I wouldn’t expect much of a middle class. The dream of each middle class generation for the next in Randistan will be for it to own a greater supply of Selective Serotonin Re-Uptake Inhibitors than its parents’ generation did. The red states already threaten secession on a regular basis…so why not let them. In fact, why not help them? Does anyone really believe Americans actually have enough in common to justify remaining united? Does anyone actually believe America’s rightwing Mullahs and absolutist ideologues and purveyors of irrationality and unreality will look behind them and see the light of the Enlightenment ever again? Listen, if you live in a red state our immigration policy here in the blue will always be wide open. Your current location isn’t destiny, so come on in. Give me your sane, your sensible, your civilized masses yearning to breathe free. Send these, your tempest tossed by giant, insufferable bags of authoritarian wet brownies like the Koch brothers, by cynical douchebags of the plutocracy like Grover Norquist and Mitt Romney, the dumbbells and McCarthyite Tea Party loons in the U. S. congress and the nativist nitwits in Arizona. I lift my lamp beside the golden door and the Golden Gate.